Its hard to change bad habits but it's possible. People do it everyday. 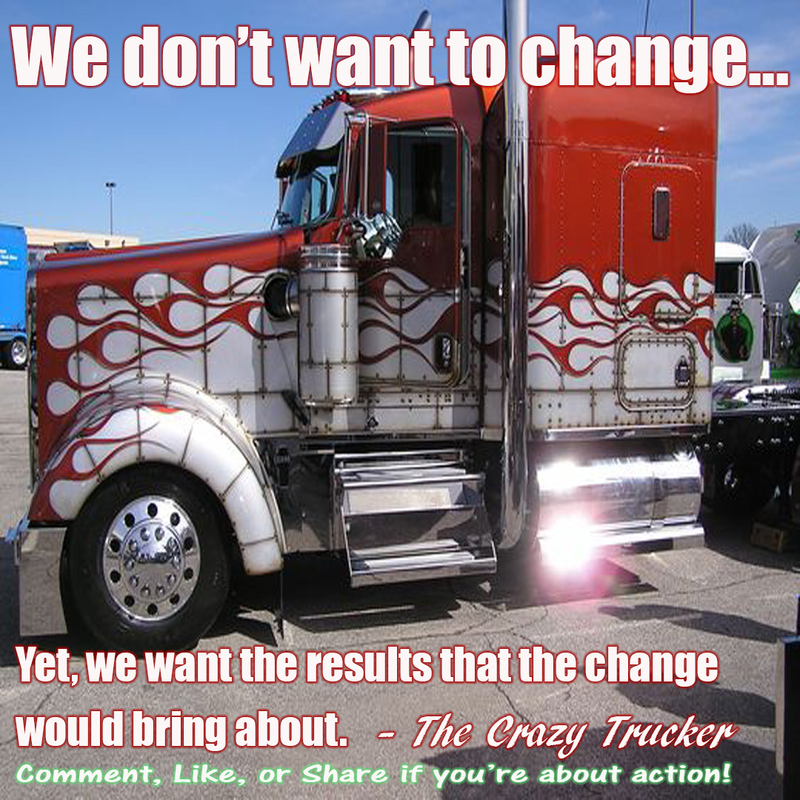 Trucking jobs ffer a unique opportunity to change bad habits because you are away from the environment where many of the triggers and people that could influence you to continue those bad habits. However, there are other bad habits you will want to avoid as a trucker which I will cover in and after you watch the video. This video is about using trucking to help change bad habits. Changing bad habits is hard but when you become a truck driver you have half of the battle won. Many of us become aware of our bad habits but can't change them because of the enormous amount of discipline it takes to change bad habits while still being surrounded by the same environment which is saturated with triggers that encourages the bad habits. As a truck driver you are no longer in that environment. You are now away from the people, places and things that help to keep you trapped in your old ways. Freedom is what you have. Freedom from pressure of your friends who hasn't yet seen the big picture of life. Sometimes your friends may even fault you for wanting to make a positive change in your life. Well you don't have to worry about that cause you don't even have to mention that. You are working. The biggest challenge will be not to pick up new bad habits from the road! Eating junk food (That includes fast food). Spending all your money in the truck stops or Casinos. Simply make a conscious effort to not expose yourself to some of the temptations out here on the road. Its easier to avoid things altogether than to try it just to see how it is thinking you will break away from it later. How do you think so many people get stuck with bad habits. They thought they were going to try it, whatever it is one time and they been doing it every since. Some things to stay away from are . . . The convenience of fast food. When you come on the road you want to start off with your own supply of food from Walmart or your favorite place to shop for groceries so that you will develop a habit of preparing your own food instead of developing a habit of eating at the truck stop every day all day. You end up spending most of the money you make and gaining a lot of fat weight eating junk out of the truck stop. If your going to eat at the truck stops avoid the cakes, hot dogs, and sodas. Drugs for recreation You will hear people on the radio some place like Memphis Tn. (I think he's a cop anyway) Never take a chance at trying drugs to have a good time. Learn to enjoy what life has to offer with depending on drugs or alcohol. If that is a temptation for you then make it a habit not to park places that you will learn are likely to present that challenge to you. Lot Lizards are still roaming around at some truck stops but not many. It's usually just at the same places. Why would you take the risk of taking a disease home to your wife or girlfriend for an 1 or so of pleasure. It's not worth it. If they are roaming around the parking lot, they probably haven't bathed and they are likely to be drug users which means they are even more likely to be carrying some type of disease. If that isn't enough to keep you away. Drivers have gotten robbed by the girls and they have gotten robbed by the girls accomplices after the girl gets in the truck. If that isn't enough for you big truck drivers and their trucks have been often get impounded by the police department when a lot lizard is caught in your truck. Again, if that is a particular temptation for you. Avoid even stopping at places they frequent. Becoming a truck driver can be used for changing bad habits instead of letting it cause you to develop bad habits. Which one fits better in the big picture you have for your life? Changing bad habits will bring you lasting happiness. If you develop bad habits it may bring you immediate gratification but you will likely suffer from the effects of those bad habit for the rest of your unhappy life. Here are a few videos to help develop a positive attitude and look at life in a way that you seek to learn, set goals, and aim for self actualization. Sometimes we have to make things happen instead of waiting for things to happen. However, if we are not enroute to a specific destination how will we know what turns to make. So we go around and around in a circle expecting things to change. Imagine that. The new year's video about doing things differently. Aiming for your dreams. Preparing for the future.